Focus on the TMF (Trial Master File) varies greatly by company. I was surprised to see that even some of the bigger companies in attendance have only made the TMF a major focus in the past few years. People working in the TMF at all sorts of different companies seem to be struggling to get buy-in from management. It can take years for these TMF stakeholders to secure the resources and processes (human and IT) to support a quality TMF. The good news is that among this year’s attendees, most companies are now seeming to understanding the value of a compliant, inspection-ready TMF at all times (and not only at inspection time). There are still many people in the clinical research industry that have limited experience with the TMF. Whether working in monitoring, project management, or another functional line, most of us that work in clinical research create or handle documents that become part of the TMF. Because of this universal involvement, it is important for everyone to have a basic understanding of the TMF, especially since TMF management is no longer a back-room function for ‘other’ document management professionals to handle. As more functional lines assume ownership of their contributions to the TMF, I think it will naturally become easier keep a TMF in good shape throughout the trial. When the TMF is considered ’somebody else’s problem’ it usually becomes a mad dash to collect and file documents right before an inspection or submission. Increased buy-in by functional lines helps to avoid the mad dash. It is equally important to have fully trained experienced human personnel as it is to have a state-of-the-art eTMF system. Well trained people can do what technology cannot: follow up with outstanding issues, keep the TMF up to date, and anticipate and support inspections. Whatever technology a company chooses, it is essential that it fit your company’s needs. While there are many great options out there, don’t be distracted by flashy features. Consider what is needed in uniquely by your team. Appraise the system or solution not just based on cost, but also by what type of reporting features you might need, your adaptability and flexibility requirements, and what kind of IT support you will need to bring to the table. With the right people and technology in conjunction with the right processes, the future of your TMF looks bright. When people, technology, and processes are not working together, a major problem is usually just around the corner. 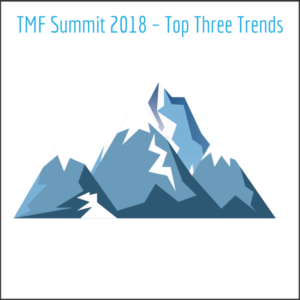 These, of course, are just a few of the trends that I noticed at this year’s TMF summit. I look forward to next year’s TMF Summit and seeing how the industry as a whole continues to adapt and change in response to new technology, human factors, and ever-changing industry regulations.